It might be a world of cold here on the Sussex coast, but things are hotting up over in Dallas, Texas. 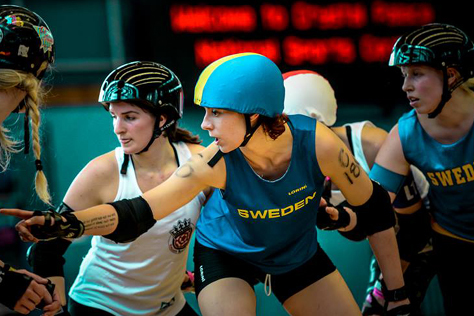 This weekend sees the second ever Blood & Thunder Roller Derby World Cup. There’s a whopping THIRTY national sides taking part in the 2014 tournament, quite a jump from the thirteen that took part in Toronto in 2011. The action kicks off at 9am Texas time (3pm GMT) tomorrow (Thursday 4th Dec) and runs until around 8pm on Sunday, ie 2am Monday over here. If you don’t happen to be near enough to Dallas to pop down and watch it in the flesh, weekend passes for the online stream cost about £30 ($45). That might sound spendy, but it does include over 70 tournament games – albeit with three taking place at once until the final day – along with four exhibition matches (Vagine Regime, USA v USA, Juniors and WC All-Stars). Failing that, you can follow the scores on Twitter. As in 2011, the Rockers are one of the few highly ranked UK leagues with no players taking part in the World Cup. The Mighty Mighty Bash was part of England’s team in the previous tournament, but not as a Brighton player. [Incidentally, Bash’s mum was part of Team New Zealand in 2011 – unfortunately the two nations didn’t play each other.] Although she had being coaching the Rockers for nearly two years at the time of the World Cup, Bash didn’t transfer to Brighton as a player until a couple of weeks after the tournament, so officially took part in the WC as a London Rockin’ Roller. She was one of three Rockers who made it to the 60 skater ‘longlist’ for England’s 2014 squad – along with Shambolic and Chariot Sophia – but surprisingly none of them made the final cut. Which can only suggest that the twenty who did are BEYOND EPIC. As far as we know, no-one from Brighton tried out for any of the other national sides, whilst a few English leagues (with much bigger rosters than the Rockers) have players representing six or seven different countries. That’s not to say there’s no Sussex folks involved in Dallas. There are – just not on wheels. John Hesse is one of the busiest photographers in derby these days. As well as being the official tog for all three leagues (women’s, men’s, junior) in his hometown Eastbourne, he also does the honours for the Rockers, both in terms of the awesome action shots you’ll find on Facebook after most home bouts, as well as official player portraits. Almost half the photos we ourselves use, on this website and in our fanzine, are John’s, so he’s kinda the official BRATS photographer too. This weekend though, he’ll be donning a pass in Texas as official shutter clicker for the largely UK based Team West Indies. Having documented the young national team’s build up to the tournament, he’ll be capturing the on and off track Dallas adventures of a side many derby fans worldwide have already adopted as their ‘second team’ for the tournament. There’s local representation amidst the ranks of the NSOs too. Pettichoke cut her officiating teeth with the Brighton Rockers. You can still catch her (clipboard in hand) at derby bouts in Sussex, but she’s become increasingly in demand for NSO duties further afield. 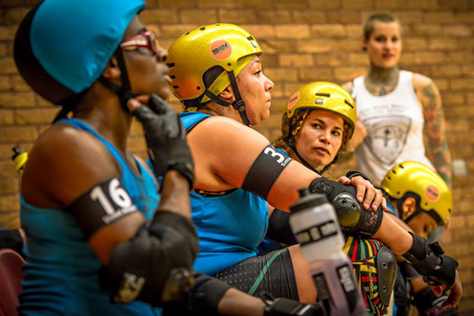 One of a handful of UK officials with a Level 2 WFTDA Certification, Pettichoke recently acted as Division Head NSO for the South West in the Heartland Series, the tournament that is giving birth to next year’s British Championships. This weekend she’ll be in Texas as part of one of the six NSO crews keeping the World Cup on track. Bombshells and sometime Rockers ref Danger Russ, who head reffed Heartlands South West, is also present on a different NSOing crew, and we believe some members of the announcing team – such as Seaside Siren Mother Mercy – are no strangers to Haywards Heath either. Whilst none of Brighton’s small roster of players are taking part in this weekend’s tournament, some of the skaters who are will be familiar to fans as players the Rockers have faced on track in recent years. Of the thirty teams taking part, 17 are European and the majority of these will contain at least one person to have played against Brighton. Further afield, the same is true of Team West Indies, although the fact that most of their squad is UK based/born might be a factor there! Indeed, Bash’s alma mater and close friend league of Brighton, the London Rockin’ Rollers play a major role in TWI, with Jack Attack benching and Inside Line editor Rammit captaining the side alongside a further three LRR players. The West Indies player to have met the Rockers most recently on track is Croydon’s Polly Filla, who took part in July’s epic derby derby at the Dolphin. So which World Cup team features the most people who have played against the Rockers in open door competition? The logic of geography would suggest England, but we’re pretty sure that’s not the case. 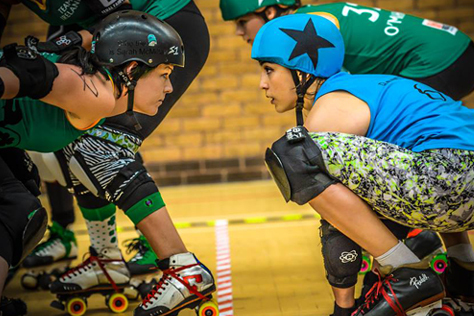 A whopping 70% of England’s twenty woman squad come from a single league, the fearsome London Rollergirls. Although Brighton have faced LRG’s B- and C-teams on track, most of their England contingent were already ensconced in the A-team at the time. Half of England’s non-LRG players have played the Rockers in Haywards Heath this year [Middlesbrough duo Terri Sudron and Ellie Storey plus Rainy City’s Fay Roberts], but we’re still only looking at five or six players in total from the national squad. There’s a similar number in the French squad, with many of the small roster that Paris Rollergirls brought to Sussex in March present in Team France – including diminutive jammer Hooligan, probably our favourite opposition starhead of 2014. Belgium could have been in with a shout too, but a planned Rockers’ rematch with the country’s top side Go-Go Gent is yet to take place, and very few of Gent’s sizable WC contingent took part in the previous (March 2012) game. We expect that at least one well known Rocker will be cheering for NZ in this group. The Kiwis finished 8th in 2011 and the other three sides are all World Cup newcomers. South Africa are the most unknown quantity here. Roller derby is less well developed in Norway than in some nations, with only a couple of teams of note, but the national side have also drawn on players from the likes of LRG and Texas here. A lot of people in the Welsh derby community were surprised Wales couldn’t get a team together for 2011, so they’ll certainly be chomping at the bit in their first appearance on the world stage. Paris Rollergirls spend much of their time playing leagues in European powerhouse nations England and Germany, with somewhat variable results – thumping victories one minute, last jam losses the next. With PRG players forming the backbone of Team France, the national side will be looking for more consistency if they are to improve on their 7th place finish at the last World Cup. They shouldn’t have a problem making in through the group stage – only Brazil have previous WC experience, finishing 12th in 2011. The presence of two Portuguese speaking nations should prove for interesting rivalry and on track banter. By far the most interesting group geographically. Will the differing cultures these teams represent lend themselves to differing styles of derby? Sweden finished 6th in 2011 and are hoping to better that here. A lot of people are wondering if Team Japan can win the hearts and minds of the crowd the way their men’s team did earlier this year. They’ll have competition in the crowd favourites’ stakes from the West Indies. The Caribbean islands are largely represented here by skaters from the London Rockin’ Rollers and Birmingham Blitz Dames – the latter’s home venue hosted this year’s inaugural Men’s Derby WC, and one wonders if that will give them any advantage in dealing with the atmosphere and energy of such a global tournament. The Finns finished 5th last time out and will be hoping to continue their record as the top Scandinavian side. [Actually Finland isn’t technically part of Scandinavia, but you know what we mean.] The Rockers-bashing Scots are coming into this tournament on a wave of confidence. 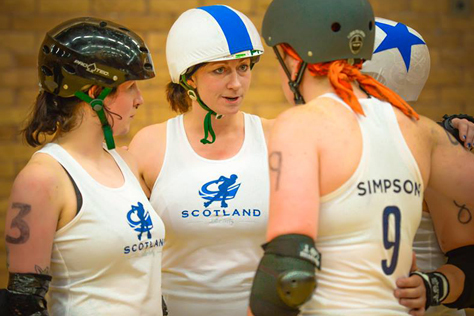 At league level, Glasgow Roller Derby and Edinburgh’s Auld Reekie have a strong hold the top two spots in the UK derby table, with only LRG and Stockholm above them in the Euro rankings, and the national side have had a lot of strong wins recently. They’ll be looking to improve on their 11th place from 2011, but neither Colombia or Mexico will be anyone’s pushovers. The Aussies took 4th place at the last World Cup and should be confident of a similar finish this time around. Melbourne’s Victorian Roller Derby are one of only two non-North American leagues to have penetrated Division 1 of WFTDA. They were narrowly edged out by LRG in the Championship quarter finals, although they have since overtaken the Londoners in the rankings, With VRDL’s bench coach and a cluster of their players in this Australia squad, they certainly have top level experience in their ranks. Amongst those cheering the Aussies on from a sofa in Sussex will be Rockers star Racey. The three European sides here are fairly unknown quantities, although Belgium has the stronger local leagues. This is the only all-European group and features three sides that finished in the Top Ten in 2011. England took third then and will be looking to go one better this time. Many had tipped Germany to take the third place going into the tournament, based on the strong European showing of leagues like Bear City and Stuttgart, but they had to settle for 9th. That was just one place above Ireland, which suggests the battle for the second qualifying place in this group could be amongst the most intense in the tournament. A fair few Rockers hail from Ireland, so we can expect the likes of Maidenderry and Irish Mist to be cheering on their countrywomen. Our fanzine advertiser Mr Séamus will too – especially as we’ve promised him his next ad for half price if Ireland qualify for the knockout stages. The two top seeds have the benefit of one less opponent in the group stages. Canada finished second in 2011, but lost quite heavily to England in France in February – a match that England star Missy Rascal missed her league Rainy City’s away game v Brighton to take part in. They should walk this group stage, however. Argentina finished last out of the thirteen teams in the previous World Cup, but their men’s team were the breakout stars of this year’s Men’s WC and the women will be hoping to emulate that. Denmark, largely built around players from Copenhagen Roller Derby, won’t be making things easy for them though. We’re not saying it’s inevitable that the USA will win all their WC games by 300+ points, but it would be a big surprise if they didn’t. The world’s top derby nation by quite some way (home to almost 90% of WFTDA’s Division One leagues) are locked on to repeat their 2011 tournament victory. The other two sides are new to the World Cup. The Netherlands isn’t as strong a derby nation as some would expect – its top ranked side Amsterdam place well below a couple of leagues from neighbouring Belgium, for example – whilst Puerto Rico, whose people recent voted to become the 51st state (something the US has yet to agree on), are a real unknown. We’re not going to try and guess the group standings here, as there are sure to be at least a few upsets along the way, but we will point out a few match-ups we’d like to see. Firstly, should the West Indies finish second in their group they would almost certainly meet England in the first knockout round. This would provide an interesting situation where almost everyone on track skates for an English league! The way the tournament is structured, with a re-seeding of teams for the quarter finals, means a lot of the more interesting potential match-ups (such as Sweden v Finland or Australia v New Zealand) are highly unlikely. One very logical sequence of results would see England meeting New Zealand in the quarter finals – three years too late for the Family Bash. The closest game could well be Canada v England – in all likelihood these teams will meet in the semis and juke it out for the honour of being roundly hammered by Team USA in the final. We’ll know soon enough. This entry was tagged Blood & Thunder, Brighton Rockers, British Championships RD, Dallas, Heartland Series, roller derby, Roller Derby World Cup, rollerskating, sport, Team England, Team West Indies, Texas, WFTDA, women's sport.